This product requires the base game Pillars of Eternity II Deadfire - Season Pass. 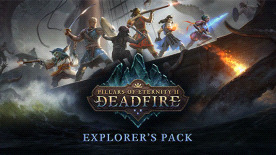 • Original Soundtrack: The soundtrack to Pillars of Eternity II: Deadfire by Justin Bell, featuring all-new tracks inspired by the peoples and factions of the Deadfire Archipelago. •Hi-Res Digital Map: This handsome sea chart is suitable for use as a desktop wallpaper or can be printed to assist you with navigating the treacherous waters of the Deadfire Archipelago.